Hey Everyone! Today I wanted to do a bit of a colour themed post which is basically me showing you all of my favourite products in a certain colour. 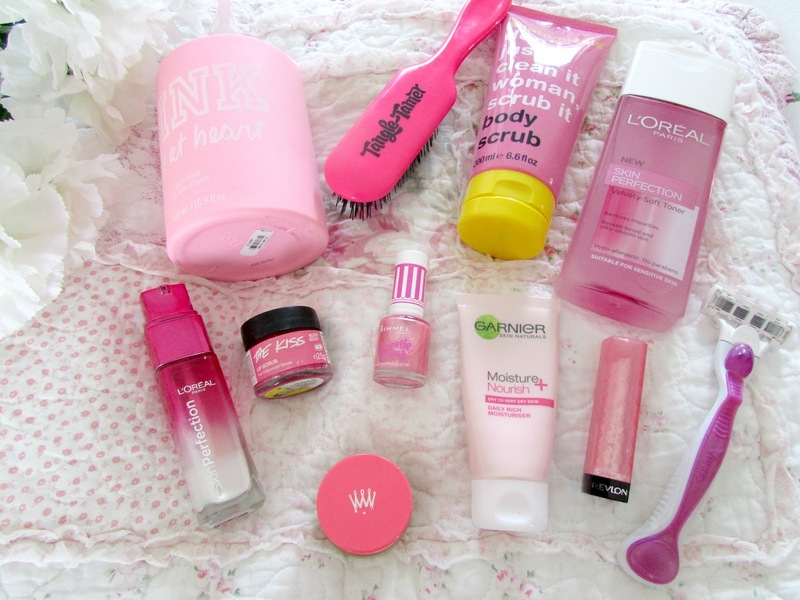 When I was looking around I noticed that most of my products were in pink! Huge shock there right? It amazes me how many pink products I actually have but I love using all these things as I'm sure you know as I have mentioned them on my blog before but if you haven't read my previous posts and want to know why I love everything here then keep on reading! Wow that's a mouthful isn't it?! I absolutely love this body lotion. It's a very light but very hydrating moisturiser for the spring and summer I think. It sinks into the skin very quickly and smells absolutely incredible too. It has a very fresh scent to it which normally I'm not a huge fan of as I prefer sweeter scents however this just smells absolutely incredible and the scent definitely lasts on the skin for a good few hours after applying this. I love the chunky packaging and the colour of it as well. I think it looks really pretty sat on my dressing table. Whilst everyone raves on about the tangle teezer I think I'm the only person on the blogosphere to rave about the tangle tamer. I've never seen it on any other blog but I absolutely love it. I prefer it so much more to the tangle teezer as I just find it gets rids of the knots in my hair a lot easier than the tangle tamer does. It doesn't pull at my hair and is really gentle too. I also love using this in the shower once I've washed my hair as it just works incredibly well on wet hair. It's also cheaper than the tangle teezer as well so if you haven't checked this brush out I'd highly encourage you too! Once again another huge mouthful for a product however I absolutely love this scrub. I tried a body wash from the range and I wasn't a huge fan of it but that's probably because it was rose scented and I don't like rose smells but this scrub is just amazing. It has a very sweet scent to it and it's really lovely on the skin. It buffs away all the dead skin and really does leave it feeling extremely soft and smooth. I got this with a Love Me Beauty box a couple of months ago. This stuff is absolutely incredible. It just removes all my make up incredibly well and leaves the skin feeling so soft and smooth. I've been using this every morning and night recently since I've got it and have definitely noticed such a difference in my skin. It definitely does what it says on the packaging. L'Oreal is definitely one of my all time favourite brands when it comes to skin care. I've used so many of their products and I've never been disappointed in anything I've tried. I don't know if you can tell by the photo above but I hardly have any of this left. I absolutely love using this under my make up as I find it really evens out my skin tone and provides the perfect base for make up. I absolutely love it. I absolutely love Lush and their lip scrubs. I think I have everyone they have but my favourite one is definitely 'The Kiss' which is one they released for valentine's day this year. It has the exact same formula as their other lip scrubs except this one had a few sugar strands and few little hearts for valentines day in it. I always use this on my lips before brushing my teeth and it really does buff away all the dry skin from your lips and leaves them feeling incredibly smooth. I absolutely love this nail polish. I think the name is so cute and I love the design on it as well. It's such a pretty nail polish. It goes on so easily on the nails and doesn't chip easily either which I love. I also think the name is so adorable too. Probably my favourite ever lip balm. I don't think I can ever use another one as I just find it absolutely incredible. It's so incredibly hydrating, smells absolutely amazing and really does stop my lips from drying out. I tend to use this before bed as it's really thick so it can work it's magic over night. Sometimes when I wake up I can still feel it working which is a definitely plus. It's not a lip balm I would recommend for during the day wear as it is really thick but overnight or lazy days it's absolutely fine. I'm just going to keep my thoughts for this product very simple. Incredibly hydrating, cheap and works wonders on my skin. I'd highly recommend this for those of you who have very dry skin as it's the best drugstore moisturiser I've come across to help combat those pesky dry patches of skin. I absolutely love the Revlon Lip Butters. I went through a phase a couple of years ago where I would buy them non stop. I just love how moisturising and glossy they are on the lips. They are the most hydrating lip products I've ever used. I absolutely love the strawberry shortcake colour as I think it's the perfect shade of pink for my skin tone. I can't find many lip products that suit my skin tone but this definitely does. Yes I am just casually showing you the razor that I use to shave my legs because...why not? I absolutely love this. It's the most amazing razor I've ever used. It really does remove every inch of hair from my legs and also smells amazing. I also love the moisture bars that are on the razor as they smell absolutely amazing and I find that really does make a different in making sure my legs don't get really dry after shaving. If you haven't checked this out yet I'd highly recommend it. It's amazing. I hope you enjoyed reading this post regarding all my favourite pink beauty products. I've enjoyed writing this post and I also love reading posts like this too. I've always wanted to write a colour themed post but didn't know what colours to use and since everything on my dressing table was basically pink I thought that would be the perfect choice. Be sure to let me know in the comments below what your favourite pink products are. What's your favourite colour for beauty products? I actually have that Tangle Tamer too, I have a Tangle Teezer as well and I think they are equally as good!